Weighted average cost of capital (WACC) is a calculation of a firm's cost of capital in which each category of capital is proportionately weighted. All capital sources - common stock, preferred stock, bonds and any other long-term debt - are included in a WACC calculation. All else equal, the WACC of a firm increases as the beta and rate of return on equity increases, as an increase in WACC notes a decrease in valuation and a higher risk. Broadly speaking, a company's assets are financed by either debt or equity. WACC is the average of the costs of these sources of financing, each of which is weighted by its respective use in the given situation. By taking a weighted average, we can see how much interest the company has to pay for every dollar it finances. A firm's WACC is the overall required return on the firm as a whole and, as such, it is often used internally by company directors to determine the economic feasibility of expansionary opportunities and mergers. It is the appropriate discount rate to use for cash flows with risk that is similar to that of the overall firm. The capital funding of a company is made up of two components: debt and equity. Lenders and equity holders each expect a certain return on the funds or capital they have provided. The cost of capital is the expected return to equity owners (or shareholders) and to debtholders, so WACC tells us the return that both stakeholders - equity owners and lenders - can expect. WACC, in other words, represents the investor's opportunity cost of taking on the risk of putting money into a company. To understand WACC, think of a company as a bag of money. The money in the bag comes from two sources: debt and equity. Money from business operations is not a third source because, after paying for debt, any cash left over that is not returned to shareholders in the form of dividends is kept in the bag on behalf of shareholders. If debt holders require a 10% return on their investment and shareholders require a 20% return, then, on average, projects funded by the bag of money will have to return 15% to satisfy debt and equity holders. The 15% is the WACC. If the only money the bag held was $50 from debtholders and $50 from shareholders, and the company invested $100 in a project, to meet expectations the project would have to return $5 a year to debtholders and $10 a year to shareholders. This would require a total return of $15 a year, or a 15% WACC. Securities analysts employ WACC all the time when valuing and selecting investments. In discounted cash flow analysis, for instance, WACC is used as the discount rate applied to future cash flows for deriving a business's net present value. WACC can be used as a hurdle rate against which to assess ROIC performance. It also plays a key role in economic value added (EVA) calculations. Investors use WACC as a tool to decide whether to invest. The WACC represents the minimum rate of return at which a company produces value for its investors. Let's say a company produces a return of 20% and has a WACC of 11%. That means that for every dollar the company invests into capital, the company is creating nine cents of value. By contrast, if the company's return is less than WACC, the company is shedding value, which indicates that investors should put their money elsewhere. WACC serves as a useful reality check for investors. To be blunt, the average investor probably wouldn't go to the trouble of calculating WACC because it is a complicated measure that requires a lot of detailed company information. Nonetheless, it helps investors to know the meaning of WACC when they see it in brokerage analysts' reports. Be warned: the WACC formula seems easier to calculate than it really is. Just as two people will hardly ever interpret a piece of art the same way, rarely will two people derive the same WACC. And even if two people do reach the same WACC, all the other applied judgments and valuation methods will likely ensure that each has a different opinion regarding the components that comprise the company's value. WACC, or Weighted Average Cost of Capital, is a financial metric used to measure the cost of capital to a firm. It is most usually used to provide a discount rate for a financed project, because the cost of financing the capital is a fairly logical price tag to put on the investment. WACC is used to determine the discount rate used in a DCF valuation model. The two main sources a company has to raise money are equity and debt. WACC is the average of the costs of these two sources of finance, and gives each one the appropriate weighting. Using a weighted average cost of capital allows the firm to calculate the exact cost of financing any project. The weighted average cost of capital (WACC) is the rate that a company is expected to pay on average to all its security holders to finance its assets. The WACC is the minimum return that a company must earn on an existing asset base to satisfy its creditors, owners, and other providers of capital, or they will invest elsewhere. Companies raise money from a number of sources: common equity, preferred stock, straight debt, convertible debt, exchangeable debt, warrants, options, pension liabilities, executive stock options, governmental subsidies, and so on. Different securities, which represent different sources of finance, are expected to generate different returns. 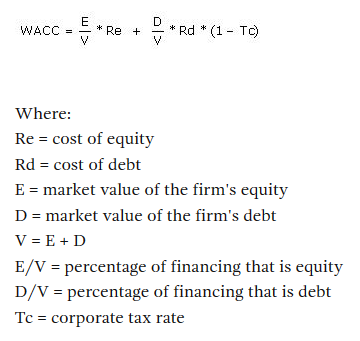 The WACC is calculated taking into account the relative weights of each component of the capital structure. The more complex the company's capital structure, the more laborious it is to calculate the WACC.